Founded on the idea that car dealerships always have a “secret” bottom dollar price that consumers rarely see, CarPriceSecrets.com is a website that allows shoppers to browse through cars, submit information to be connected to local dealerships, and see those “secret” price deals that can’t be found anywhere else. While history on the company isn’t easily obtained, their Terms and Services were last updated in 2009, so it is safe to assume that the company has been around for a minimum of five years. The first thing to know about CarPriceSecrets.com is that they only offer information pertaining to new cars. There are no listings or paid advertisements from dealers on the website. Instead, users search through models from over 30 car brands, or search by type of vehicle (such as “wagon”, “convertible”, or “hybrid”). Once you’ve narrowed your search down that far, you can then choose a specific model, and see an overview for the newest version of that model that is currently being sold. There are reviews from users, and car features and safety information is listed below. Additionally, CarPriceSecrets.com offers a list of comparable vehicles that you may want to look at, similar to Amazon’s “Customers Also Liked…” feature. After you’ve decided which vehicle you want to consider further, you must enter identifying information (name, email, phone, and address) in order to receive quotes from dealerships nearby. In this stage, you’ll get the “secret” offers for price, but nothing guarantees that dealerships will stick by the prices they offered through a CarPriceSecrets.com contact. The process described above is all that CarPriceSecrets.com does. There is no blog with information on car prices, car buying, or car ownership. They don’t have any specific comparison tool to help you choose between several options, and there is no specific price information until after you offer your personal information. User reviews are there, but they are scarce, and it isn’t clear where these reviews are coming from, because there is no option to leave a review yourself on the site. Customer service can be reached through a feedback form on the website, but there is a message that Cars.com may not respond at all. The dealer partner page includes a phone number and an email address for further help. The website is very straightforward and easy to use, and considering that their services do not extend beyond taking your information and sending it to local dealerships, it’s not likely that a shopper would need to contact customer service. 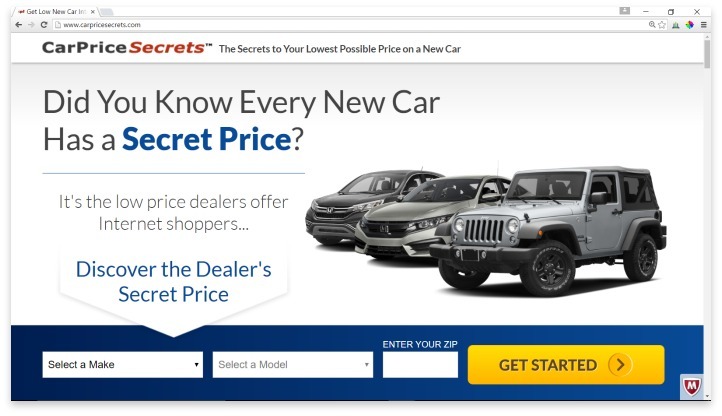 CarPriceSecrets.com allows shoppers to browse through cars, submit information to be connected to local dealerships, and see those “secret” price deals that can’t be found anywhere else. CarPriceSecrets.com has a good gimmick, and may entice many users to check out their services. And, if you don’t have time to go to dealerships for research, and would rather the dealerships come to you, then their services may be right for you. You can simply send off a few notices of interest, and wait for offers to come in. However, for most buyers, there are plenty of other car listing services that offer better tools, better information, and with less invasive practices, to utilize. Local dealerships list their prices on more feature-rich websites across the Internet, and you’ll likely find yourself negotiating anyway, regardless of the CarPriceSecrets.com offer. Have you had an experience with this company? Please share your CarPriceSecrets.com Reviews below.